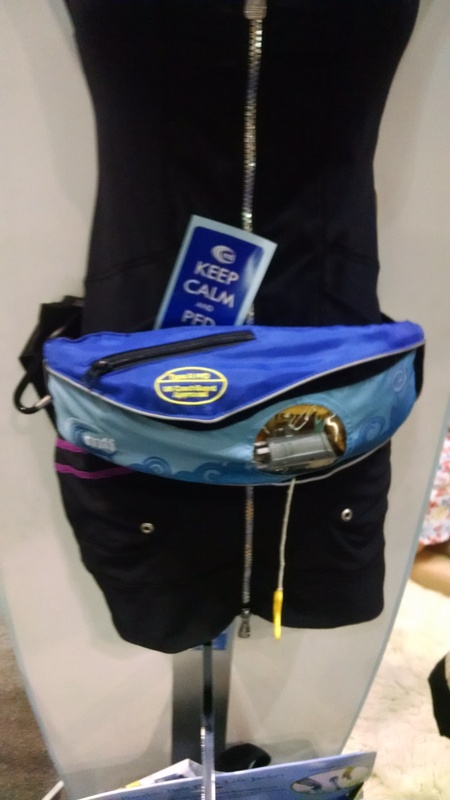 Surf Expo wasn’t just about paddles and SUP’s, but it also featured some PFDs as well. We spent some time with MTI Adventurewear’s Lili Colby to learn about the improvements made to existing MTI PFDs as well as some new styles. 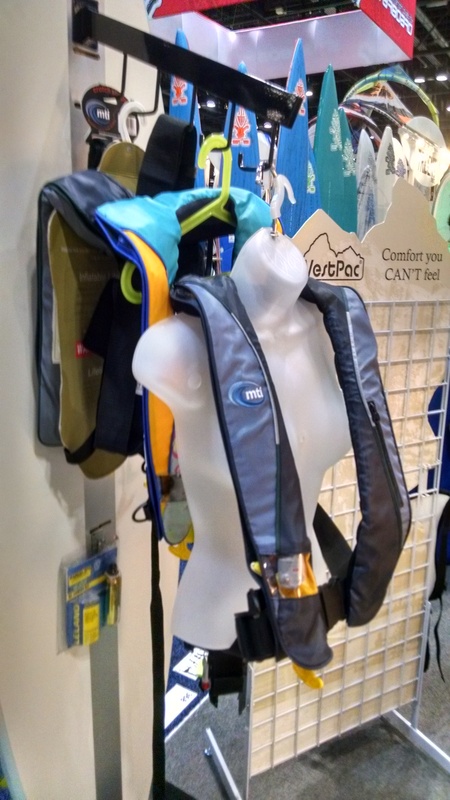 We’ve always liked the PFDs from MTI Adventurewear. Not only do they fit extremely well, but also offer multiple safety features that an angler should be using on the water. We predominantly use the Helios Inflatable PFD and they’ve taken an already great product and made it even better. MTI has also developed the Helios in a ladies edition for the lady anglers out there. 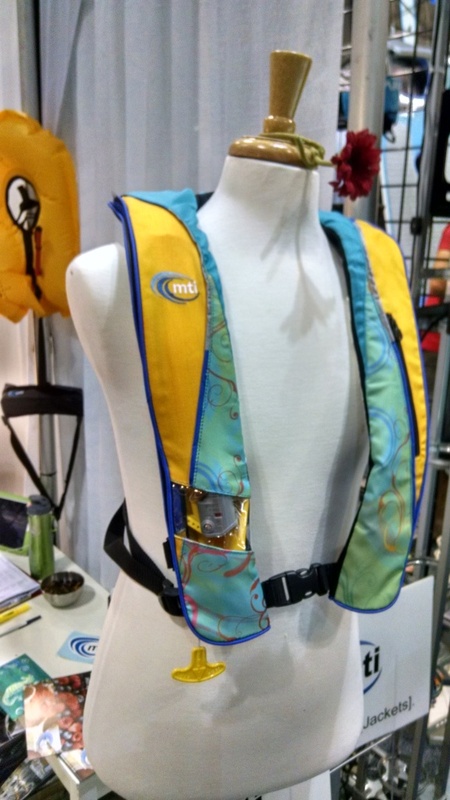 MTI made some amazing changes to the Helios Inflatable PFD. The new slender shape lays flatter and is more comfortable for the angler to wear. 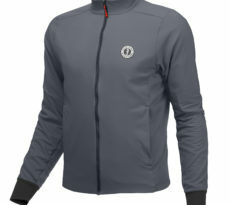 The neck area was widened and now will have a soft neoprene neckline added to increase all day comfort. The straps are also a litle wider and longer making sure of an even better fit for the angler. As usual, MTI has reflective strips on the PFD to help aid the angler with being seen on the water. 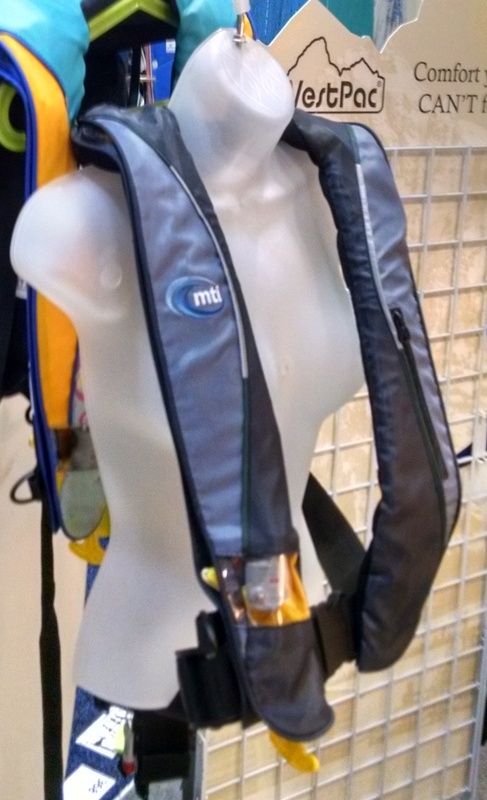 MTI has also added a Dasiy Chain Attachment System on the back for adding a strobe light, hyration pack, or fishing net. A chest storage pocket with a zip encloure ensures important items are kept safe. The site window also ensures the angler will be able to see the status of their CO2 cartridge mor clearly. MTI also equips each Helios PFD with a tethered whistle, which is required for all anglers wearing the PFD. MTI also took the Helios to a completely new level when it comes to lady anglers. The Caribe Print brings out a great looking style and pattern for lady anglers who want to look great on the water. The unique print ensure that each Helios for the lady’s will be completely different and unique, giving basically a one of a kind look to each Helios PFD. With these improvements, anglers (both male and female) will have a proper fitting and comfortable PFD on the water, but also offers a stylish and unique feel to each PFD. The MSRP on the Helios PFD will continue to remain in the $135 range. The only drawback to the new Helios is that we’ll all have to wait until April 2015 to get our hands on them. 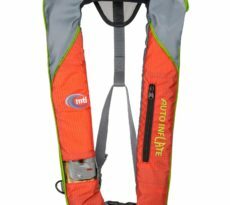 MTI also offers SUP specific floatation in the Fluid 2.0 SUP pfd. The Fluid 2.0 brings a compact and slim shape with a 3D mesh padded comfort belt. The Fluid 2.0 comes in 3 colors: OM Print, Race Red, and Moonlight Black. The Fluid 2.0 is a US Coast Guard TYPE III pfd, approved to be worn or carried on your SUP. It offers a zipper storage pocket, and includes a signal whistle and holster. This pfd is perfect for the SUP angler who wants to keep a clean deck, yet still have full range of motion when paddling and searching for the next trophy fish. The MSRP on the Fluid 2.0 will be $129.95 – $134.95. MTI also introduced some new colors for the upcoming year, including hi-vis colors on their fishing PFDs: Calcutta, Dio F Spec, and Solaris. 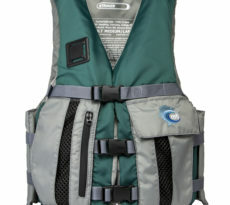 Also look for new colors in the Women’s Moxie pfd, better pockets, and a new sunglass strap.